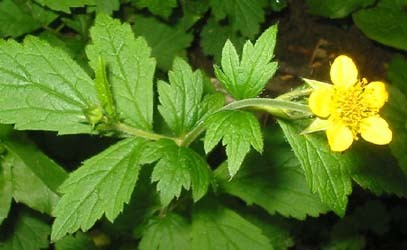 (Herb bennet) Once known as the herba benedicta, the blessed herb. In the Middle Ages the plant was thought to evoke the presence of Christ and offer protection against evil influence. It appears as a decorative feature in the stonework and stained glass of Medieval cathedrals, the three leaves symbolizing the Trinity, and the five-petalled flowers the five wounds of the crucifixion. Medicinally it is thought to be beneficial against stomach upset, and as an external application to wounds. It contains tannins that give it an astringent, anti-inflammatory effect. Native to Europe, Asia and the Mediterranean, it is a perennial with small yellow flowers borne on thin wiry stems, preferring rich moist soil in shade. The root has a clove scent, and was much prized as a flavouring for ale and stews. Medieval gardeners would only harvest the root on March 25, and only under certain conditions, but for modern usage the root can be harvested anytime in the spring and used fresh or dried.